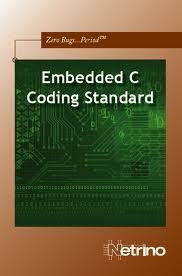 First of all, why a c coding standard? I have been working in my life in small and medium companies and in most of them, we always had the same problem. No c coding standard. Everyone had their own standard and very often, those standard are not standard, because it used to change every project. Every time some one quit the company, it’s always the same problem: code badly written, no comments, hard to read, hard to understand and overall hard to maintain. So this book is a very good start point for those who works in a company which doesn’t have a standard and want to deploy one. First Michael Barr make clear that the code written is a property of the company and not of the programmer. A standard code eliminates conflict over items that are sometimes viewed as personal stylistic preferences. Yet, a standard can prevent some bugs because it forces a programmer to follow some good practices that people normally doesn’t do, like always open and close braces, even in a if with only one statement. Create the comments before begins to code once we have to know what the functions must do before start coding. I think that nowadays we have big screens and the IDE is much better than before, so I don’t see any problem in use more than 80 columns. Use goto, continue or break. I understand that the use of this keywords can lead to “spaguetti” code, but if you really know what are you doing, I don’t think that you’ll have problems. We can always adapt this standard. The most important thing is to have one and follow it. For sure it will save you several hours of debugging and it will improve your code quality.